This little essay and dialogue started out as an answer to a simple question, but it kind of grew more than I had intended at first. I guess in the end it pretty much ran away from me. 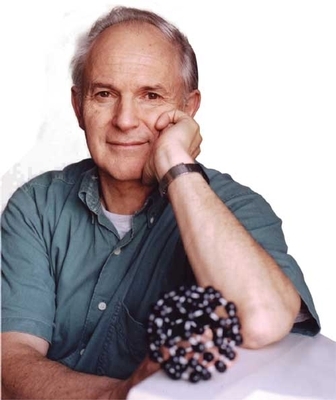 With regard to Francis Schaeffer and the need for purpose in the universe: I remember when I was majoring in zoology as an undergraduate, I had it drilled it into my head that teleological questions were illegitimate in science, particularly in biology. Theoretically the professors abided by that point of view in their work. Bertrand Russell’s essay “A Free Man’s Worship” is a rather bleak celebration of the purposelessness of a materialist atheism. Presumably it’s possible on a purely theoretical level to maintain that the universe has no purpose and, without committing the fallacy of division, that, consequently, parts of the universe that look as though they have a purpose do so only from a subjective, ephemeral point of view. So, if at first glance it appears that Schaeffer overstates his argument by bringing in the need for a purposive universe prior to positing God, that critique seems to be true. However, we can make a good case that he’s still right on target. 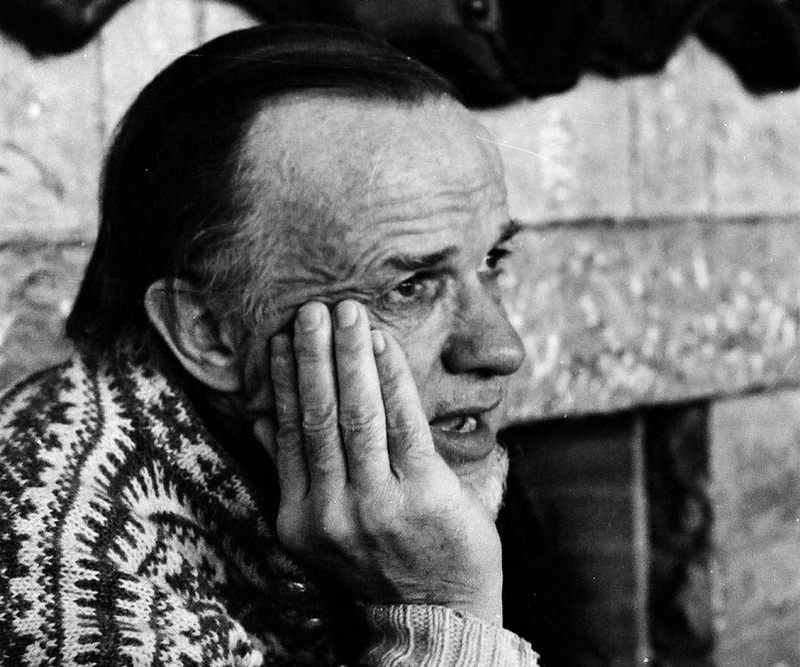 In order to understand Francis Schaeffer, we have to realize that >viability< was just as important a criterion for him as >logical consistency.< Or, let me put it this way, for Schaeffer, true consistency always included viability as well, viz. that asserting one world view conceptually while living according to another world view counts against the one that’s being asserted theoretically. Schaeffer’s approach was often to respond with practical reminders rather than abstract arguments. –When a student said, “We’re not communicating,” Schaeffer did not say, “That’s a self-refuting statement,” but he barked at him, “Pour me some tea,” and the student complied. They had communicated. –When a young man insisted that nothing was real, Schaeffer eventually got him to see the unacceptability of his assertion by saying something like, “Just keep that notion in mind when you take your beloved into your arms tonight.” The young man swore at him; he had gotten the point. –Even allowing for more of a tongue-in-cheek interpretation of John Cage than Schaeffer did, he was still right that with his music, Cage was expressing a world view of randomness that he certainly ignored with his hobby of mushroom hunting. So, it’s not just rational inconsistency per se that drives people into the “upper story” of irrational escape, it can also be a theoretically consistent world view, which is impossible to live out. Now, when I’m saying that it is impossible to live out, i.e. the world view is inviable, I don’t just mean that it’s really, really hard. When I’ve brought up this point at other times, some students have responded by asking whether on that criterion Christianity isn’t also inviable because, supposedly, it’s impossible for anyone to live a perfect Christian life. But that’s not the same thing. Theoretically, someone could do just that. It’s logically possible. But nobody can live their lives according to such principles as that nothing exists, there is no truth, the consequences of actions do not matter, etc. So, then, though not as clear-cut as, say, a pure materialism, an ateleological universe is also impossible to maintain. Now, keep in mind that I don’t have to know everything about a subject in order to have knowledge about something on that subject. If you ask the question, “Okay, so then, what’s the purpose of the universe?” we’re running way ahead of the investigation. It would be much better here to say that the universe exhibits “puposiveness” or “teleology,” than to say that “it has a purpose” because the fomer expressions speak to the parts as well as the whole, while the latter requires more of a framework than might be accessible at that point. 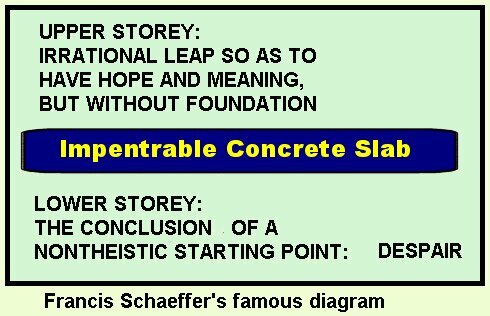 Now, I’m tempted to go the Thomist route and provide a metaphysical justification for my assertions, but let’s try the Schaefferian route and imagine a dialog that might be in his spirit. I couldn’t claim that this is how Schaeffer would respond, and I’m not attributing this imaginary dialog to him, but I hope I’m catching the essence of the first part of his methodology, which he has labeled as “blowing the roof off.” I’ll put myself into the role of the Christian and take all the blame for deficiencies. So, Win and a student (S) have reached a crucial point in a rather intense discussion.